Organisers of the Vanitha Mathil said an estimated 30-50 lakh women came together to form the human wall from Kasargod in northern Kerala to Thiruvananthapuram in the south. The event was held in the backdrop of the Sabarimala controversy. Lakhs of women, including celebrities, turned up to form the human wall. 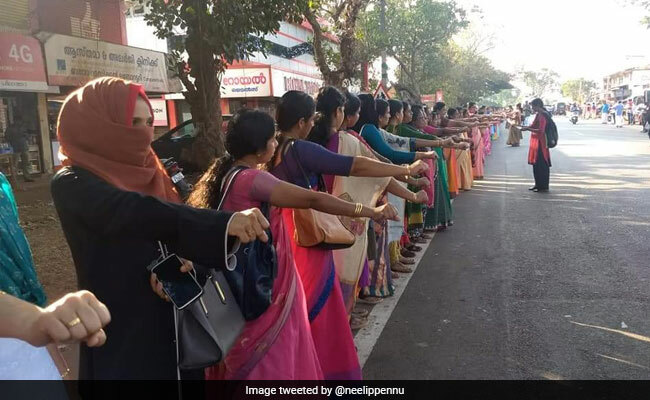 Lakhs of women literally joined hands to form a human chain extending from north Kerala to its extreme south today to promote gender equality and renaissance values in the backdrop of the Sabarimala controversy. The ruling Pinarayi Vijayan government had sounded the call for this chain. According to organisers of the state-sponsored Vanitha Mathil (which translates to 'Women's Wall'), an estimated 30-50 lakh women have come together to form the human wall from Kasargod in northern Kerala to Thiruvananthapuram in the south. In her inaugural address, Communist Party of India(Marxist) leader Brinda Karat termed the human wall as an expression of women's equality in every sphere of life. "Some women believe in worshipping Lord Ayyappa in a particular manner, and we respect that. However, it is unconstitutional to stop women who want to seek his darshan directly," she said, referring to recent protests by right-wing groups against a Supreme Court verdict lifting an age-old ban on women of menstrual age undertaking the Sabarimala pilgrimage. While Health Minister KK Shylaja led the chain at Kasargod, Ms Karat was the person at the end of the chain in Thiruvananthapuram. A team of the Universal Records Forum, which records amazing feats across the globe, also came to the state. "The Sangh Parivar has been trying to communalise Kerala," Chief Minister Pinarayi Vijayan said. "While each woman has the right to decide whether she wants to go to Sabarimala or not, the larger issue is about the Supreme Court ruling that women and man have equal rights to worship. This wall is about gender equality and equal opportunities." But state BJP Mahila Morcha president KT Rema said the state-organised human chain harbours no such noble motive. "This wall is actually a communal wall. The Chief Minister is trying to divide the women and people of Kerala on the lines of religion and caste for votes," she said. The Congress was not very supportive either. Many of those who came to form the wall -- including actors Rima Kaling, Parvathi, Nina Kurup, Mala Parvathy and Sajitha Madathil - disagreed with Ms Rema's claim. "If protection is provided, I would like to visit Sabarimala too. It is our right to equal worship. We cannot be discriminated against," said artist Kajal Dutt. The event was organised by the ruling CPI(M) along with over 176 other socio-political organisations, including the CPI, Sree Narayana Dharma Paripalana Yogam and the Kerala Pulayar Maha Sabha. It has been opposed by the Rashtriya Swayamsevak Sangh, the Nair Service Society (NSS) and certain right-wing groups. The BJP had backed the Ayyappa Jyothi event, wherein many right-wing supporters formed a chain from northern to southern Kerala to protest against the Supreme Court verdict, on December 26. The Kerala police registered cases against 1,400 people associated with the event for holding it without permission. The Ayyappa Jyothi was supposed to counter the 'Vanitha Mathil'.